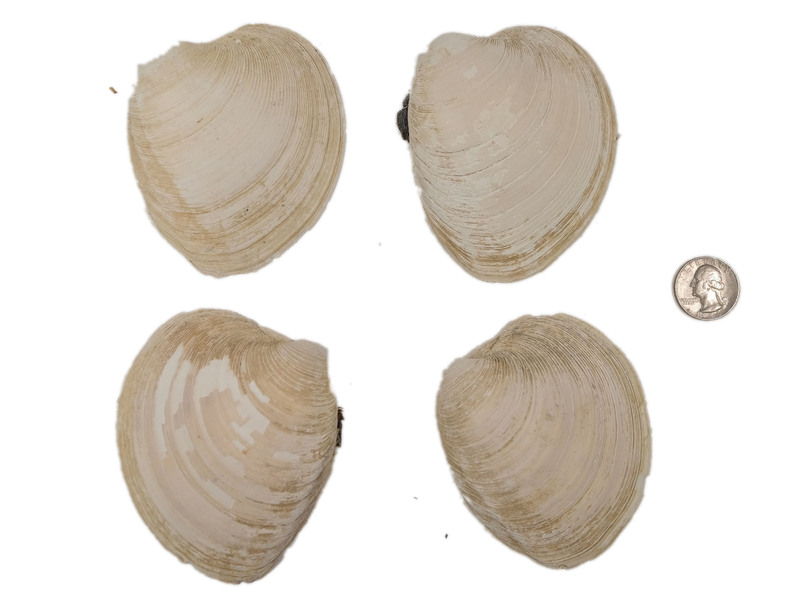 The quahog (or quahaug) is native to the eastern shores of North America. 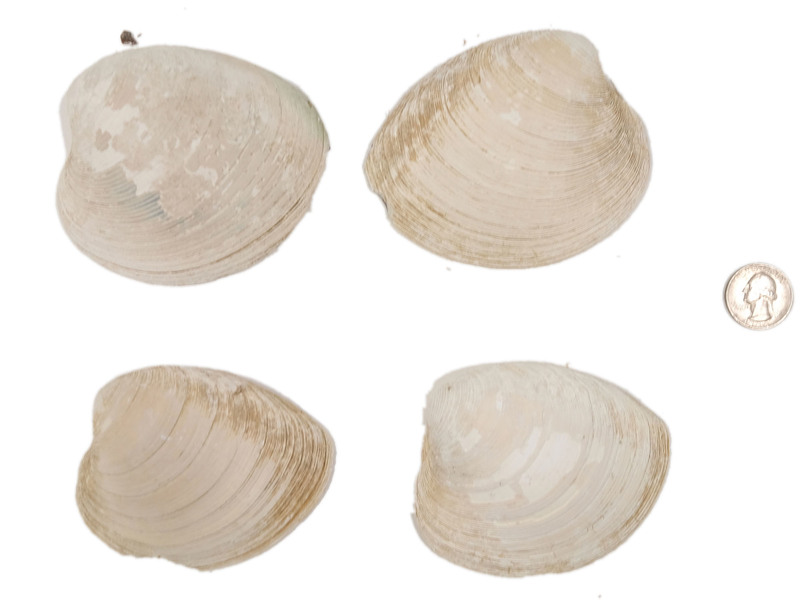 There are specialist names for different sizes of this species of clam. 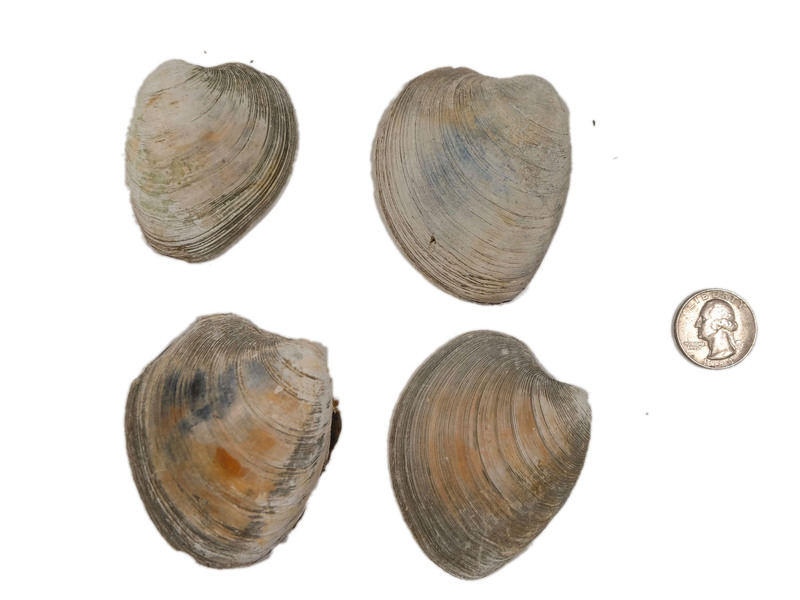 The smallest clams are called countnecks, next size up are littlenecks, then topnecks. Above that are the cherry stones, and the largest are called quahogs or chowder clams. The shells have been shucked and cleaned in cold water. These are sold by the half shell; they do not come in pairs. 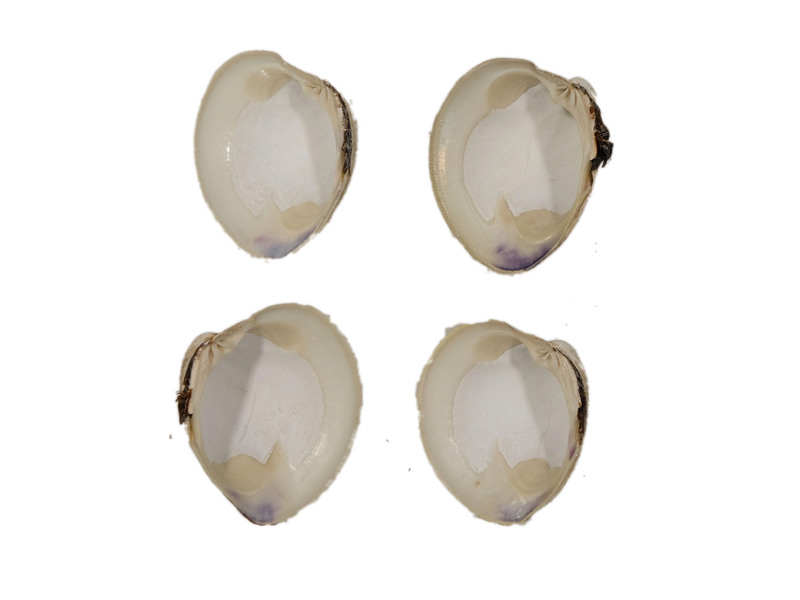 We sort our quahog shells into different grades. See below for photos and descriptions of the different grades. 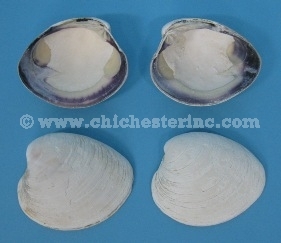 We also offer assorted quahog shells in lots of 100 shells as we get them in from our shell supplier. These are only available when new shipments arrive and are offered in lots of 100 shells or more to avoid disappointment in the randomness of smaller size orders. When we get in a large shipment, we fill existing large orders and then grade the remaining stock. 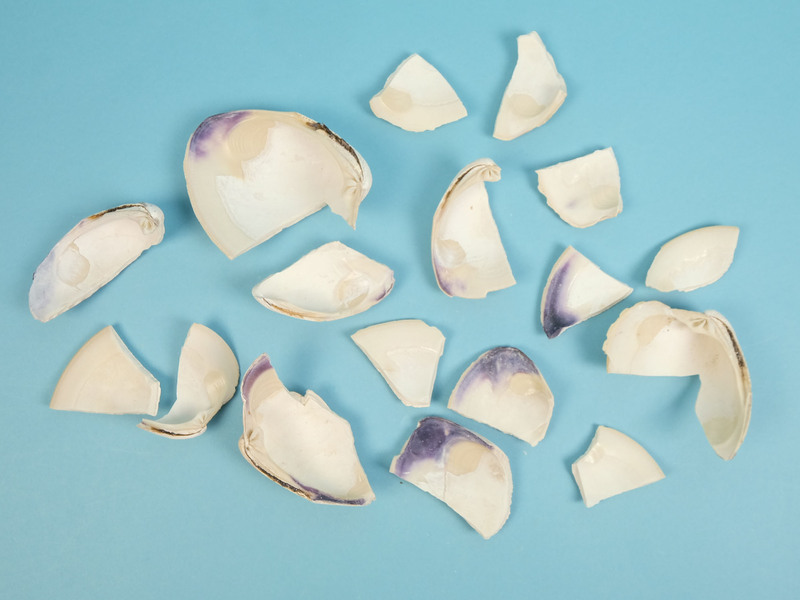 The assorted shells are not sorted in any way, therefore, the size and degree of purple on a shell can vary significantly and they may also have minor edge chips. We also sell broken quahog shells by the pound. They are sorted into slightly chipped shells and small pieces. R-1080-B1 Broken Quahog Shell:Slightly Chipped (lb) US$4.99 / lb. R-1080-B3 Broken Quahog Shell:Small Pieces (lb) US$4.99 / lb. Genus and species: Mercenaria mercenaria. Wild. This species is not endangered. The shells are a by-product of the food industry and come from sustainable fisheries. A USFWS export permit is required for all exports outside of the U.S. The jewelry grade shells are fresh shells that have been washed in cold water and never heated. This makes them easier to work with when making jewelry. They have extensive purple. Ideal for manufacturing. 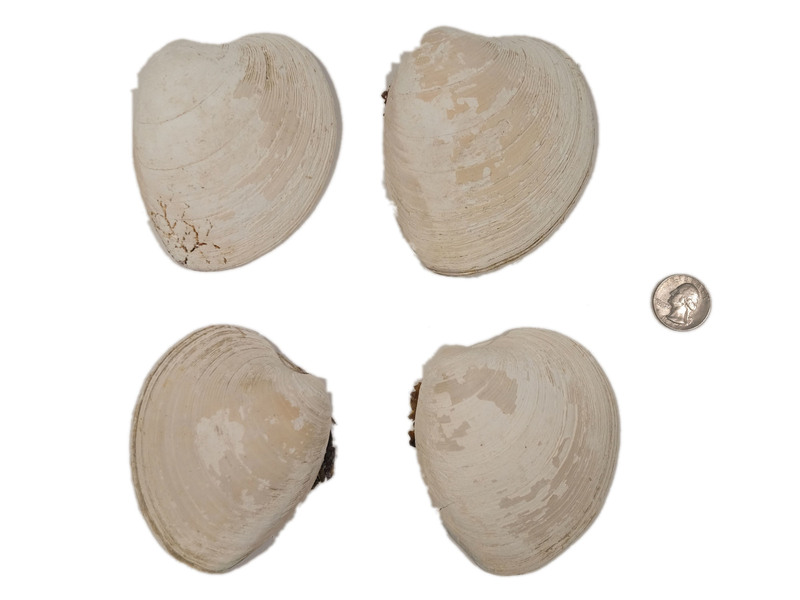 The jewelry grade shells are smaller in size than the other quahog shells. They are approximately 3" long by 2" wide and weigh 30 grams. See a size comparison to a quarter. 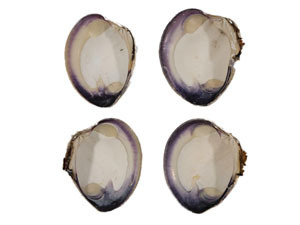 The select quahog shells are excellent shells with extensive purple that are highly sought after. There may be minor chips, but not significant chips or cracks. These are the top 5% to 10%. We do not upgrade from first quality to select if we run out of first quality. Each shell is approximately 4" to 4.5" long and 3" to 3.5" wide and weighs approximately 129 grams. The vast majority of shells are #1 or first quality. They are good shells with varying levels of purple typically on one side. There may be minor chips, but no major chips or cracks. Each shell is approximately 4" to 4.5" long and 3" to 3.5" wide and weighs approximately 129 grams. 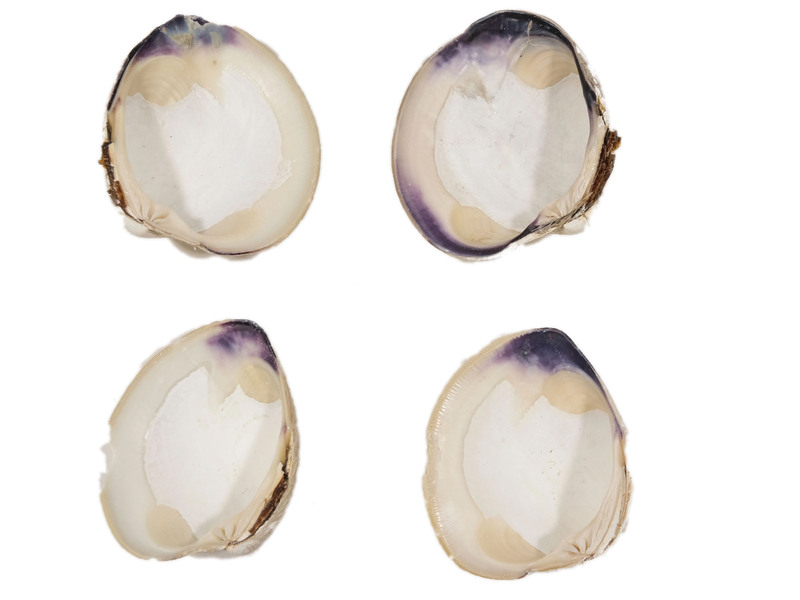 The #2 or second quality are full shells with just a touch of purple and/or minor chips. Each shell is approximately 4" to 4.5" long and 3" to 3.5" wide and weighs approximately 129 grams. 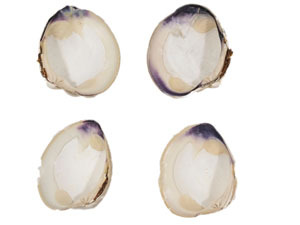 The #3 or third quality quahogs are full shells, with either no purple or more significant chips, lines, or other cosmetic problems. They can have varying degrees of purple or no purple. The majority of these tend to be good quahogs, just missing the purple edges. Each shell is approximately 4" to 4.5" long and 3" to 3.5" wide and weighs approximately 129 grams. 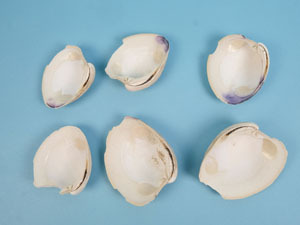 These are slightly chipped quahog shells sold by the pound. There are approximately 5 to 7 shells per pound; however, the number of shells per pound will vary depending on the size of the shells. 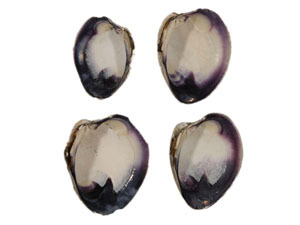 Each shell is approximately 4" long and 3" to 3.5" wide but sizes will vary. 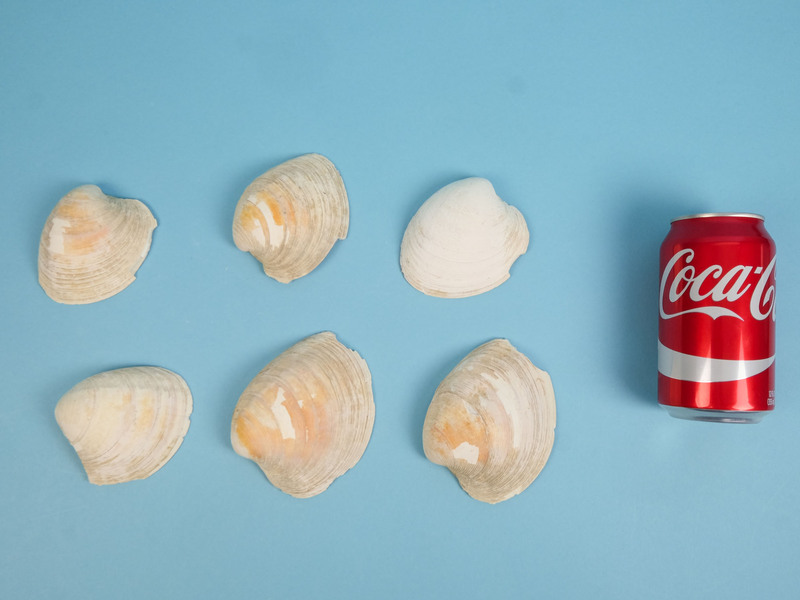 See a size comparison to a soda can. 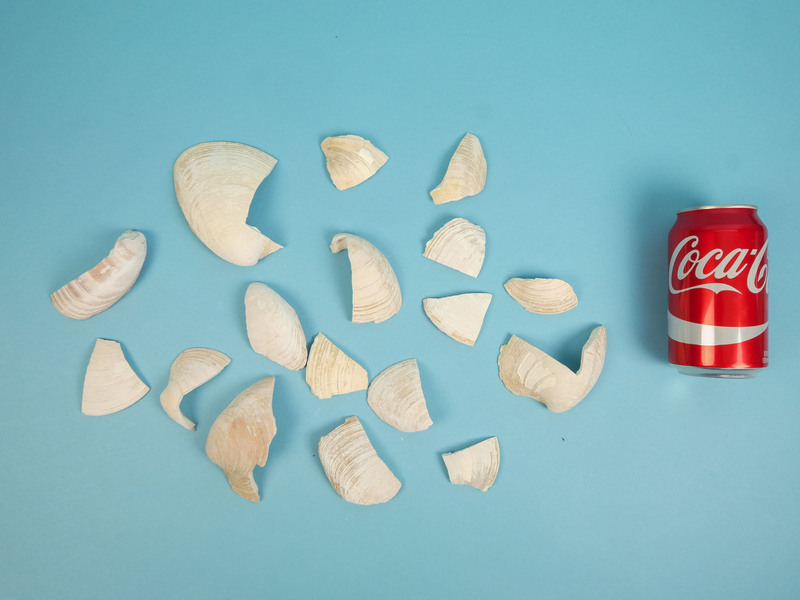 One pound of chipped shells. 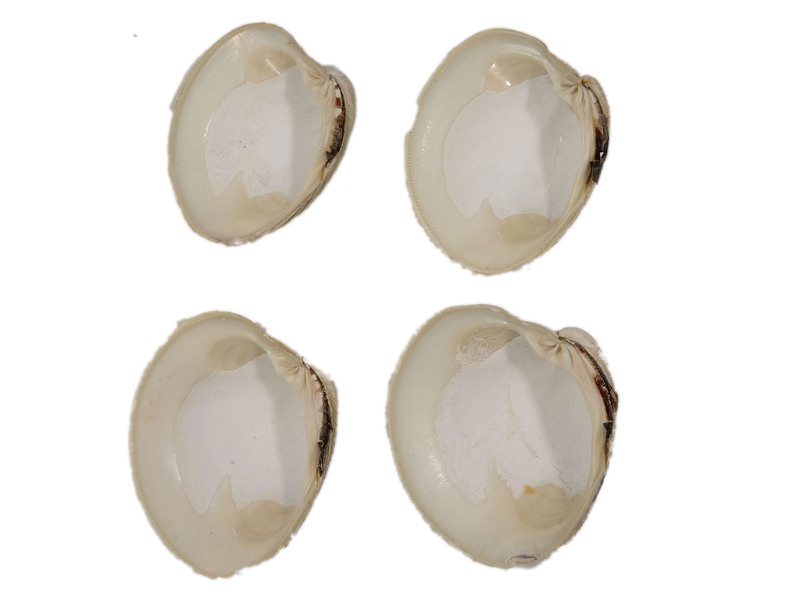 These are small pieces of quahog shells sold by the pound. 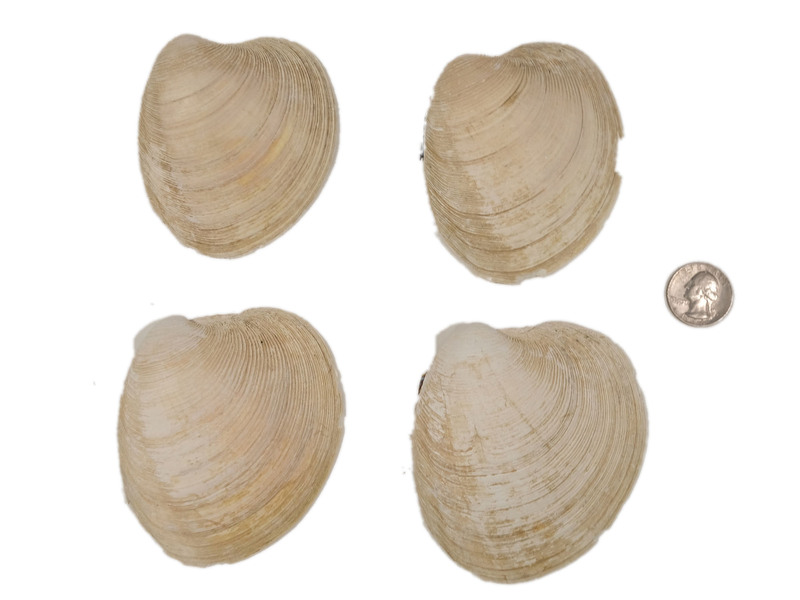 There are approximately 15 to 20 pieces of shell per pound. The number of pieces per pound will vary depending on the size of the shell pieces. One pound of small pieces of shell.